Epicure Cabinetry combines the advantages of European frameless cabinetry and the warmth that most Americans prefer in our homes. Epicure is modern, ergonomic, space efficient, and gentle on our environment. Frameless cabinets are cabinets without face frames. Epicure's tops bottoms and end panels are all 3/4" thick plywood with a 1/4" thick solid banding on the edge. They are both doweled and pocket screwed together. This creates an extremely rigid cabinet with an opening that is typically 1-1/2" larger than a face frame cabinet. You will really notice the additional storage room in drawers and smaller cabinets. Epicure also offers the most modern innovations. 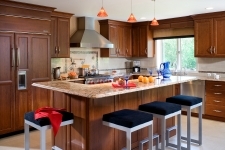 Wall cabinets are available with lift-up doors, so that the cabinets can be open the whole time a cook is creating a meal, and then, they can be closed manually or even electronically once guests arrive. Drawers can be opened with optional servo-drives as well allowing hardware to be eliminated, and drawers to be opened just by bumping them with your knee. We find this particularly beneficial on trash recepticles and other drawers that are often opened with wet hands. An almost endless combination of other ergonomic storage solutions are available in our Epicure Cabinetry as well. And, all of our wood comes from sources of sustainable forestation. As a matter of fact, if you think about it, cabinets made primarily from renewable natural resources are about as "green" of a product as America produces. And, even though wood is renewable, our cabinetry, like fine furniture, is made to last for generations. If you have been searching for modern cabinetry with the warmth of wood, Epicure Cabinetry for the Loft & Spa will be your ultimate choice.